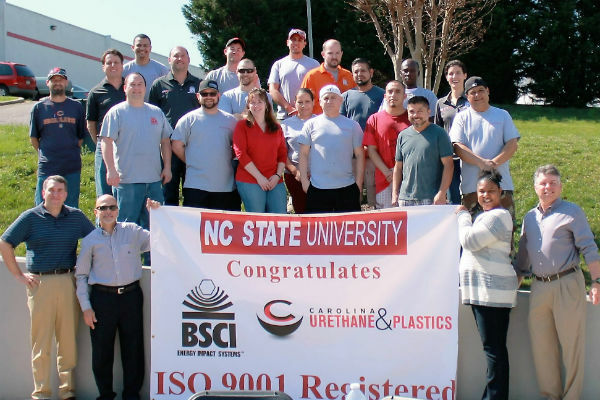 MOORESVILLE – Manufacturer BSCI, Inc. was recently awarded ISO (International Organization for Standardization) 9001:2008 certification. ISO certification is internationally recognized as an indicator of consistent quality, reliability and safety. ISO 9001, the foundation for the entire system of standards, lays out the criteria for establishing a quality management system. Adherence to ISO 9001 has proven results such as lower defect rates and higher customer satisfaction. BSCI made the decision to pursue ISO certification in order to continue to take advantage of opportunities to broaden and diversify its customer base. BSCI was founded in the early 1990s as a small family-owned company focusing on motorsports. The company has remained family-owned, and is now managed by siblings Matt Ray, Luke Ray and Greta Ray Anderson. The company maintains a solid foundation in the motorsports industry, producing specialty parts for driver safety, while having grown its capabilities to serve customers in the military, medical, marine, automotive and fitness sectors. ISO 9001:2008 will help BSCI address some of the challenges that come with rapid growth. Its emphasis on written documentation ensures that work procedures are standardized; this positively affects every aspect of production, from workflow to filling and shipping orders. 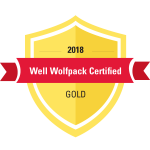 BSCI engaged NC State University Industry Expansion Solutions (IES) to help the company assess its current processes and put the new quality management system in place. IES Management Systems & Quality Specialist Adrianne Kroll and Regional Manager Gene Beneduce presented BSCI with a congratulatory banner at a private company-wide luncheon on March 14, 2016. About BSCI – BSCI designs and manufactures protective materials and products that are recommended by leading experts in crash safety. For more than 25 years, the family-owned company’s proven history of protecting the world’s most famous drivers has made BSCI the choice of the motorsports elite. In recent years, that success has propelled them to diversify into advanced safety products used by the automotive, military, aerospace, marine and fitness sectors. Headquartered in Mooresville, NC, BSCI is continuously driving innovation in the advancement of safety products. For more information, visit www.rollbarpadding.com. For more information about BCSI, contact Greta Ray Anderson at gray@rollbarpadding.com. About IES – Industry Expansion Solutions (IES) is the engineering-based, solutions-driven, client- focused unit of NC State University. Our broad portfolio and deep industry expertise help organizations grow, innovate and prosper. Our extensive partnerships with business, industry, education and government generate a unique culture of collaboration that provides access to cutting-edge expertise, research, and technology. For more information about IES, contact Teresa Bradford, Director of Marketing, at Teresa_Bradford@ncsu.edu.